One of my favorite people, Jen, is about to make her first visit Key West. With her in mind, here's a snapshot of my perfect day in the Conch Republic. 10:00 am Wake up next to George Clooney. 10:30 am Roll out of bed, throw on bikini, sundress and flip flops and walk over to Pepe's Cafe for breakfast. In my perfect day, the wait's not very long and my favorite table - the one under the tree with the chandelier is available. 1:00 pm Sweating in paradise is tough work and I'm ready for some shade and lunch. Hop on our scooters and head over to Schooner Wharf for day drinks and lunch. My favorite local musician, Michael McCloud plays there from noon to 5pm. 4:00 pm Power nap and assorted entertainment with Clooney. 8:30 pm I like to get off Duval Street to have dinner outside at Blue Heaven - get the fresh seafood special and save room for Key Lime Pie. 10:00 pm But, now that I have a full belly, it's back to Duval Street for the full experience... You've gotta do the Duval Street experience whether it's your first visit or your twenty-first visit. I've found it hard to have a bad time at these... Fat Tuesday's (I like to kick off the night here - ask for bartender Chachi), Sloppy Joe's (avoid it when cruise ships are docked, but great live music and drinks in and old school Key West bar), and Irish Kevin's (where an RA from my freshman year bartends). After that, go where ever the island takes you. (That sounds very Lost... the island knows...) If it's late and Clooney and I have been over served, I like to end the night with a slice of pizza from the stand outside Rumrunners to ward off the next day's hangover. Love these tips. Haven't been to Key West in years...will have to go to some of these places. 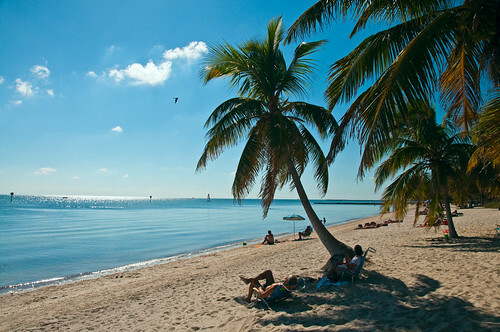 Your friend should stop at Islamorada along the way-- lovely fishing village with some equally lovely beaches. Great idea - the drive to the Keys is half of the fun! Two of my favorite stops between Miami and Key West are Alabama Jacks (alabamajacks.com) on Key Largo and Mangrove Mike's in Islamorada (mangrovemikes.com). And the view from the Seven Mile Bridge is amazing. Great post! I've only been to Key West once (college spring break senior year), it was so much fun! Was I drunk when I wrote this? How'd I miss the Green Parrot?